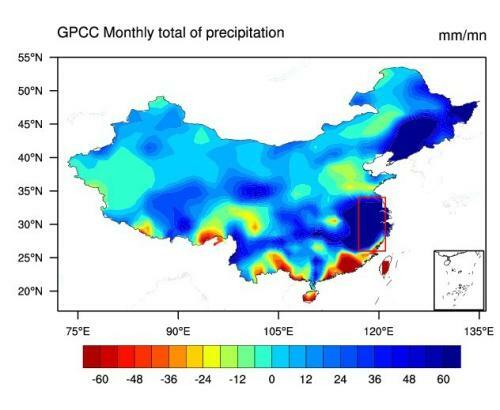 Blaming AGW for rainfall records in China, while giving El Niño caveats | Watts Up With That? From the INSTITUTE OF ATMOSPHERIC PHYSICS, CHINESE ACADEMY OF SCIENCES and the “we think but we aren’t sure, but let’s blame AGW anyway” department. In May 2016, an extreme rainfall occurred in the lower reaches of the Yangtze River Valley. The area averaged anomaly of total precipitation over the region (117°-121°E, 26°-34°N) was the third wettest on record since 1961. 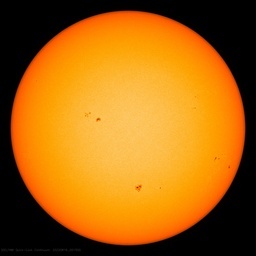 There were 25 stations broke 56-year maximum records. Meanwhile, the 2015-16 El Niño event was regarded as one of the strongest El Niño events in recorded history, bringing heavy rains and drought to different parts of world. After such a super El Niño event, what causes such precipitation extremes – the anthropogenic forcing or natural variability? And what are the changes in the risk? To answer these questions, Drs. LI Chunxiang and XIA Jiangjiang from Institute of Atmospheric Physics, Chinese Academy of Sciences, collaborated with the scientists from China Meteorological Administration, Met Office Hadley Centre of UK, University of Reading and University of Edinburgh and used the “Risk Ratio” (RR), a probabilistic extreme event attribution approach, to characterize the anthropogenic contribution to the occurrence of the extreme event. “There is a significant increase in May 2016 rainfall in model simulations relative to the climatological period, but this increase is largely attributable to natural variability. 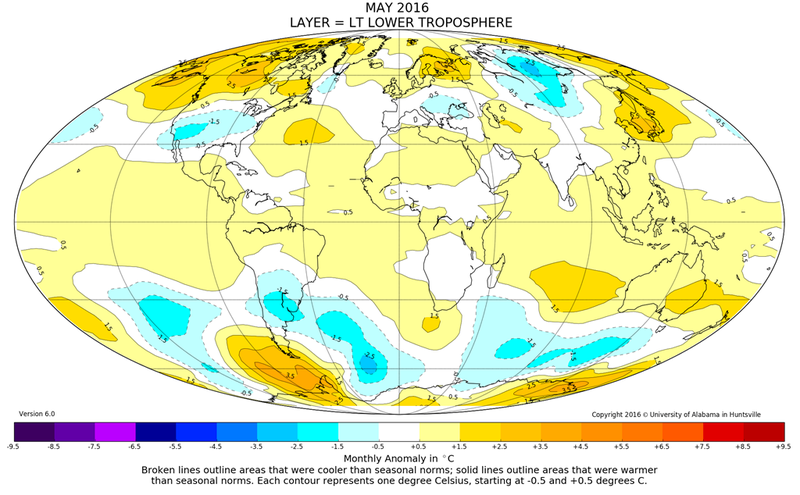 And the strong El Nin?o of 2015-16 may account for the extreme precipitation event in 2016″. Says LI Chunxiang, the first author of this study . “However, on smaller spatial scales we find that anthropogenic forcing has likely played a role in increasing the risk of extreme rainfall to the north of the Yangtze and decreasing it to the south”. The study has just been published in Environmental. Reseach. Letters. January 5, 2018 in Rainfall, records. ← “Argentinian geoscientist faces criminal charges” for not committing scientific fraud in glacier survey. I told you: it is already globally cooling. As the temperature differential between the poles and equator grows larger due to the cooling from the top, very likely something will also change on earth. Predictably, there would be a small (?) shift of cloud formation and precipitation, more towards the equator, on average. At the equator insolation is 684 W/m2 whereas on average it is 342 W/m2. So, if there are more clouds in and around the equator, this will amplify the cooling effect due to less direct natural insolation of earth (clouds deflect a lot of radiation). Furthermore, in a cooling world there is more likely less moisture in the air, but even assuming equal amounts of water vapor available in the air, a lesser amount of clouds and precipitation will be available for spreading to higher latitudes. So, a natural consequence of global cooling is that at the higher latitudes it will become cooler and/or drier. At the lower latitudes it will become more wet…. Lawrence Solomon of Energy Probe writing that we are quite likely heading into a new Little Ice Age wherein it may be necessary to give credits and subsidies for CO2 producers to create MORE CO2!!! Just about as crazy since apparently CO2 isn’t able to overcome a degree of natural variation that brilliant climate scientists can’t even recognize. God save us from the stupidity of our geniuses. Unfortunately, more CO2 is not going to help…it was a red herring. Just like the CFC and the ozone scare. I am curious, how did “they find?” I must look at the methodology and see if there is any merit. It seems incredible that in a rain event like this they can seperate the north to Anthro. causes and the South no so much so. The great flood of climate research cash. Aka- AGW confirmation cash! But was it the new wetter rain or just the old drier stuff. It’s the only way to tell if it natural or anthropomorphic. That was back when it was just weather. Now we have “extreme weather”. While they do nothing??? But they are producing Solar Panels at an incredible rate. China showed more objectivity until Trump cancelled Global warming. l note they are talking about an area in the Yangtze valley! See fellas, this is too local to be from CAGW. Ask yourselves: why a well mixed gas spread around the world would decide to discriminate against Yang valley dwellers. According to the CO2 Gospels this is an equal opportunity gas -misery for all. Here’s a reality check to help you good doctors in the future: a) It was only the 3rd biggest and the other two were with lower CO2. b) You collaborated with Badly Hadley who developed a model that gives perfect forecasts if you select the opposite of what they predict. Also they are having trouble with soggy BBQ summers in the Thames valley. You probably got their Thames weather model. I heard on good authority they have been kicked out of the weather business for the BBC, and I understand they have been timed out from supplying forecasts until they get one right for the Thames. Trust me they are using you for practice. Apparently, there are no accounts of extreme weather, such as floods or droughts, to be found in thousands of years of Chinese records. Or is it that these scientists just didn’t bother to check the records before blaming natural climate cycles on AGW? Doubtless the INSTITUTE OF ATMOSPHERIC PHYSICS, CHINESE ACADEMY OF SCIENCES will be earnestly advising the PRC government to reconsider its policies with respect to peak fossil fuel use timelines. They do lot more than nothing, taking over the west Europe’s top companies, finance building of nuclear power stations, taken control of lot of sub-Sahara natural resources and infrastructure. To paraphrase Confucius ‘as long as you keep going you’ll get there’; slowly but steadily Chinese are getting further. I thought it was obvious I meant nothing about global warming?? Chinese do about global warming as much as is necessary to profit out of it, as they do out of any opportunity coming their way, while the inaction on the AGW should be least of our worry. Seems to me they had a huge flood back in the early 60’s one the rest of the world only heard about some time later. Given the cycles weather seems to wander through are we due for another Mississippi Flood of the 1927 nature? Catastrophic floods on the Yangtze and the Huang He (Yellow River) shaped the history of China even long before the Great Flood of 1931. A great flood on the Yellow River four thousand years ago is credited as the birth of Chinese civilization with the historical efforts of some great emperor in finally stopping the flooding. Don’t tell me Chinese history is no longer taught in Chinese schools. The number of stations breaking records at the same time is not really that inspiring because, as weather does, it usually covers a wide area. Ie really wet is wet, genuinely hot is hot. But it does make it harder for the rent seeker to explain the removal or adjustment as an “anomaly”. We may already know the real reason for the rain-deluge. Lots of roads and streets there in that swath of anthro-civilization. If it rains a little, those streets get wet. And y’all know what happens then. Cause and effect, cause and effect, a bushel and a peck, look what happens when streets get wet. Global warming giveth, and it taketh away. If they collaborated with the scientists from the Met Office Hadley Centre, the University of Reading and the University of Edinburgh, then they would be bound to blame it on the burning of fossil fuels. In this post I will address Michael Mann’s assertion that record cold temperatures are the result of man-made CO2 as detailed in a recent Climate Reality Project article, mentioned by Al Gore in his “Tweet.” Before I go any further, without addressing any of his claims, the important take home is that even if Al Gore and Michael Mann are 100% correct in their analysis and conclusion, the solutions they offer will only make matters worse. If CO2 causes more draught, biofuels like Ethanol are idiotic solutions as best. If CO2 causes more rain, then solar is an idiotic solution at best. Climate cretins are the true enemy. And the cretins are inflyencing, if not out right controlling, more and more. Despite recent high sulphate levels over China and rainfall records, temperatures over China were still mostly above average. Basically means we can’t and don’t show any evidence at all for this, but we must blame any observation that occurs on it or our paper may not get published and may not get further funding. If any of the following occurred it would be included instead. 1) However, on smaller spatial scales we find that anthropogenic forcing has likely played a role in decreasing the risk of extreme rainfall to the north of the Yangtze and decreasing it to the south. 2) However, on smaller spatial scales we find that anthropogenic forcing has likely played a role in increasing the risk of extreme rainfall to the north of the Yangtze and increasing it to the south. 3) However, on smaller spatial scales we find that anthropogenic forcing has likely played a role in decreasing the risk of extreme rainfall to the north of the Yangtze and decreasing it to the south. 4) However, on smaller spatial scales we find that anthropogenic forcing has likely played a role in the risk of extreme rainfall having no change to the north of the Yangtze and having no change to the south. Blaming everything we see on something never seen, has always been religion not science. Therefore everything we see is caused by global warming, but everything we don’t see is caused by global cooling. The reality though being changed to climate change, so nothing falsifies it and therefore nothing supports it.